The GBRA Simsboro Project is a pipeline from Bastrop, Lee, and Burleson counties to San Marcos to deliver groundwater from the Simsboro Aquifer to the San Antonio Area. The project is being implemented against the objections of our Region K water planning group, the Lost Pines Groundwater Conservation District, local government entities, and the people. Read more below. The GBRA Simsboro Project is a recommended strategy in the 2011 Region L Water Plan that was approved by the Texas Water Development Board (TWDB) on December 16, 2010 even though it is in conflict with the Region K plan (which is against State laws). The Texas Water Development Board has also approved $2,500,000 from the Water Infrastructure Fund to enable the “State Water Pipeline” to be studied and plans to be developed. January 12, 2011 Environmental Stewardship provided a letter and draft resolution to the Lower Colorado Regional Water Planning Group (Region K) requesting that Region K take such actions as are necessary and prudent to protect the groundwater resources of the Region for local use without damaging the groundwater resources by “over-drafting” (mining) the aquifers. Copies of the twelve (12) resolutions opposing the GBRA Simsboro Project and copies and over 550 petition signatures were provided to the planning group (see resolutions provided to TWDB on December 16, 2010 below). Region K has agreed to place a “shortened” version of the resolution on the May agenda for consideration. December 16, 2010 Environmental Stewardship provided two letters to the Texas Water Development Board requesting that the Board deny approval of the 2011 Region L Water Plan and thereby deny the $2,500,000 Water Infrastructure Funds requested by GBRA to study the Simsboro Pipeline Project. Environmental Stewardship presented evidence that the “conflict” had not been resolved and that the project is against the will of local government entities and the people as evidenced by twelve (12) resolutions and over 400 petition signatures opposing the project. Environmental Stewardship presented evidence in its second letter that a “conflict” exists as stipulated in State Law and that significant economic, ecological, and social damage would be caused in Bastrop County. The battle lines in the Central Texas water wars are being drawn – and they cross in Bastrop County. The lines are between the water marketers who want to take water out of Bastrop County to satisfy the needs of rapidly growing communities along the 130 corridor and local water suppliers who are struggling to reserve the groundwater resources needed for local use. The objective of the Guadalupe-Blanco River Authority (GBRA) Simsboro Project is to move 30,000 acre-feet/year of water from Bastrop County under a private contract between GBRA and End-Op. End-Op has the ear of the Region L Water Planning Group and plans to move 30,000 acre-feet/year of water from Bastrop County, and 26,000 acre-feet/year of water from Lee County to the San Marcos-New Braunfels. 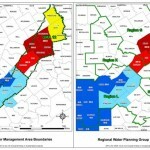 Aqua Water Supply Corporation, a nonprofit cooperative in Bastrop County, is attempting to reserve groundwater to meet the needs of water user groups in our rapidly growing region. Aqua Water was denied four of seven water well permits by the Lost Pines Groundwater Conservation District in September 2008 because of concerns about adequate water availability in the District. Both of the above groups are now vying for the same water. It is no surprise that the GBRA needs water and is looking to the Simsboro Aquifer to satisfy their shortfall; that has been going on for years. What is surprising and infuriating is how this “conflict” has been technically resolved by declaring this double-dipping to be an “overdraft” (see below). Somehow it is OK for those outside of our region to declare an “over-draft” leaving us to deal with the damage to our economy, our ecology and the integrity of our aquifers. The map below reveals that the groundwater conservation districts (GCD) in Region L are being very conservative (protective) of the Simsboro aquifer while the the GCD’s in Region K and G are being much less protective. None-the-less, Region L is demanding, without the consent of the Lost Pines Groundwater Conservation District (Bastrop and Lee counties), that ADDITIONAL water above the amount currently planned be made available for use in Region L counties. Since this amount of water is greater than the amount of water available in the counties, “over-drafting” the aquifer is required despite the desires of the Lost Pines Groundwater Conservation District to limit its drawdowns to the levels planned. Of course, as you might expect, there is a money trail that follows this project, thus the significance of the GBRA Simsboro Project being a “recommended strategy” in the Region L Water Plan (see The Smitville Times story “Pipeline project pumps up locals“). Currently the Texas Water Development Board (TWDB) is sanctioning this “taking” of water without the consent of Region K or the Lost Pines Groundwater Conservation District. Region L is demanding over-drafting the Simsboro Aquifer in Bastrop County while protecting the aquifer from over-drafting in their region. The map tells the underlaying story (click for pdf version). The color coding relates to the drawdown of the Simsboro Aquifer in each county. Drawdown is the number of feet the aquifer is expected to pumped down by the year 2060 relative to its current level. Dark blue is less than 50 feet and light blue is between 51 and 100 feet. In contrast, red is 201-250 feet of drawdown and dark red is 251-300 feet. The drawdown levels are estimated based on the target “desired future conditions” each groundwater conservation district in a groundwater management area have set for the year 2060. The map on the right reveals that the Groundwater Conservation Districts (GCD) in Region L are being very conservative (protective) of the Simsboro aquifer while the the GCD’s in Region K and G are much less protective. 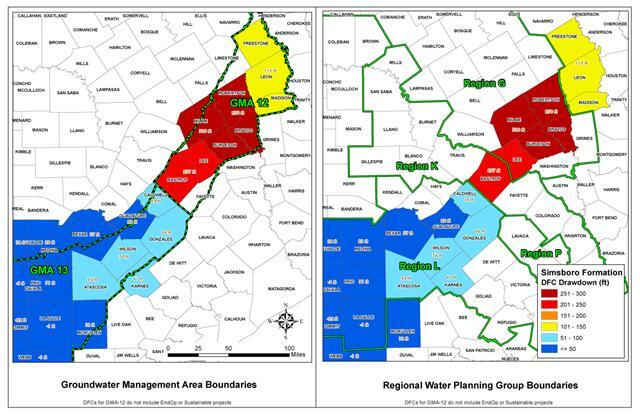 Region L is demanding, without the consent of the Lost Pines Groundwater Conservation District (in Region K and G) that ADDITIONAL water above the amount currently planned from Bastrop and Lee counties be made available for use in Region L counties. Since this amount of water is greater than the amount of water available in the counties, “over-drafting” the aquifer is required despite the desires of the Lost Pines Groundwater Conservation District to limit its drawdowns to the levels planned. Currently the Texas Water Development Board (TWDB) is sanctioning this “taking” of water without the consent of Region K or the Lost Pines Groundwater Conservation District. Lost Pines Groundwater Conservation District – Joe Cooper, General Manager @ (512) 360-5088, FAX (512) 360-5448, e-mail: lpgcd@lostpineswater.org. Aqua Water Supply Corporation – Bill Loven, General Manager @ 512-581-3116, FAX 5512-303-4881, e-mail bloven@aquawsc.com. What is “Over-Drafting” and what are the impacts? According to the Lost Pines Groundwater Conservation District, who opposes this action, “an overdraft of the aquifer could be defined as pumping more than natural recharge, having negative effects on the aquifer and existing wells. The negative effects could include drawdown of hydraulic pressure, decrease or cease of spring flows, commingling with water of poorer quality, and decreased recharge to other aquifers. These can be translated to increased pumping cost from having to pump water from deeper depths, lowering of pumps, loss of springs, reversed interaction with springs, loss of flow to artesian wells, loss of water quality and lower recharge rates to other aquifers”. Sure over-drafting is done in other parts of the State – like the much stressed Ogallala Aquifer in the panhandle – but that is not what we want in Bastrop County. It is like what would happen to your checking account if an unauthorized person were to write checks against it, taking more money than you could ever hope to deposit; however in this case, the bank is declaring it legal and you are required to pay the bill and the penalties, too! While this is all playing out there are two independent stakeholder groups working to determine the environmental needs of the Colorado River and Matagorda Bay. Each will set flow standards to get the river and bay through drought conditions and keep them ecologically sound during normal rainfall periods. One of the key impacts of “over-drafting” the aquifer is depletion of surface water that feeds the Colorado River and streams of the region. If the overdraft situation is allowed to occur we could also see a decline in the water available to keep the river healthy. So yet another battle line is being drawn – one to ensure that our river and bay have the water they need to stay healthy. To add insult to injury, our regional desire to protect our aquifers is being over-ridden by the desires of Region L as they protect their own aquifers from these very damages. See the map and explanation to the left.